Keep in mind that field aging deer is not an exact science. Aging beyond 3.5 is difficult, but for management purposes, sorting bucks into 1.5 , 2.5 and 3.5-plus age group is a good start. Field Aging can be especially difficult if the buck is a hundred or more yards away, obscured, moving, and are trying to make up your mind whether or not to shoot. Under the best of circumstances, aging white-tailed deer in the field is a calculated guess. Even when all proper methods have been utilized and all available information analyzed, you will still make mistakes. So here are a few things I consider when trying to age a deer in the field…. 1. Body size and shape is more important than antler size. 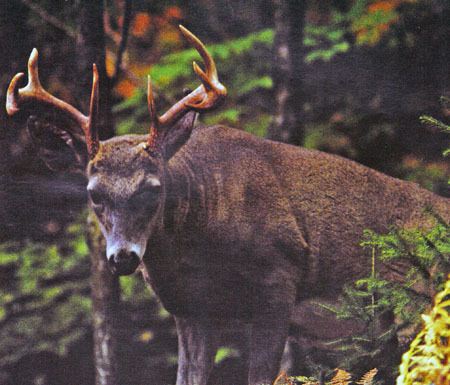 Although huge antlers are usually consistent with older bucks. 2. Look at the deer’s face and nose. A longer nose means an older deer. Fawns and yearlings typically have short faces. My buddy and I call them "round noses". 3. For mature bucks, look at their neck and shoulder/stomach area. A big mature buck will have a very thick neck and broad muscular shoulders that almost seem to be a continuation of that massive neck. Also, look for the tell-tale sag in the stomach. It is important not to mistake buck fawns for mature does. They are this year’s fawns and usually still with their mothers early in the season. Their nubs are barely visible on their heads. Buck fawns have flat foreheads while does have rounded foreheads. Buck fawns often are separated from their mothers during the breeding season and commonly observed traveling and feeding alone. These young bucks are often the first deer to appear at a feeding area or food plot. I never shoot a lone antlerless deer, especially at longer distances. I will wait for other antlerless deer to allow a size comparison. Young Deer are easy to tell. They have smaller, rounder, heads as fawns and slender heads as they get older. Young buck have faces that resemble a does. His body will also look more like that of a doe, being long, lanky and slender. His neck is skinny and his front legs are closer together at his chest. Young bucks can have antlers from spikes to ten points, yet even the biggest of racks in a 1.5 year old buck will be small and thin. Their main beams will also be much shorter than a mature buck with little antler mass. Middle-Aged Deer begin to fill out more in the body. Their bodies look more like that of a racehorse. They are now developing and putting on weight through their shoulders, neck and rump. You will notice that their bellies indent slightly from their chest, unlike a mature deer whos belly look to be a continuation of the chest all the way to the rear legs. For the first time, their antlers will begin to catch your eye. Although their antlers rarely extend beyond the width of their ears. Mature Deer will stick out like a sore thumb. They are much heavier in their bodies than middle-aged deer. Their chests become deep and their legs look shorter and farther apart at the chest. Their faces become full and their necks are flabby. Their stomachs are now big and their backs are sagged. They have lost that look of a racehorse. You even see wrinkles at the base of their ears. They look older and it is obvious. Because their body is now becoming fully developed, much of what they eat will go to the growth of those big antlers we all look for. Beams will be longer, sometimes extending past their nose when looking at them braodside. They will start to develop antler mass that is lacking in the younger bucks. With practice you can get pretty good at aging whitetails on the hoof. The more bucks you observe the better you'll get at it.